The Keta Lagoon located on the delta of the Volta River in the eastern coast of Ghana and covering a length of 126 km is the largest lagoon in Ghana. The area of the lagoon enjoys seasonal inflow of seawater during high tide from the Gulf of Guinea and regular inflow of rivers. Together with the surrounding wetlands, they form the Keta Lagoon Complex Ramsar Site. The lagoon remains a key habitat for aquatic and wetland animals and species. 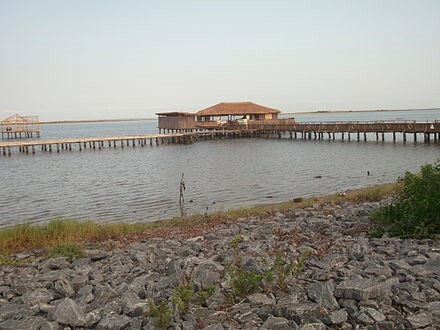 For many years, the Keta Lagoon Complex has been intensively used by a large population of people for a variety of purposes: fishing using a variety of techniques, cutting reeds for thatch and weaving, harvesting salt, and irrigating vegetable crops. Increasing exploitation of the lagoon and its resources has resulted in degradation and raised concerns about the long-term sustainability of this invaluable ecosystem. Coastal erosion and flooding are also major natural and human-induced hazards affecting this socio-ecological system. Educating resource users on the most appropriate environmental and conservation practices for the protection and health of the Keta Lagoon for sustained socio-ecological benefit is imperative. All over the world, coastlines are changing as a result of sea erosion among other human and nature-induced phenomenon. This has put many coastal dwellers to risk and has led to the destruction of their livelihood sources. Coastal ecosystems are also being degraded at unprecedented rates. The Keta lagoon coastlines one of the most severe and internationally known areas hit by sea erosion. This case study aims to highlight and create awareness of the social, ecological and economic benefits and opportunities as well as the human and natured-induced threats and challenges facing the Keta Lagoon Complex Ramsar Site (KLCRS). The study further examines the extent to which public and private sector led intervention and initiatives towards safeguarding the Keta lagoon. The KLCRS is situated between longitudes 0º49’E and 1º02’E and latitudes 5º47′ N and 6º03′ N. It is about 140 km east-northeast of the capital city of Accra, Ghana, and lies to the east of the Volta estuary. The Lagoon considered the largest in Ghana, covers a water area of 300 km2 (Figure 1). The KLCRS is an internationally important wetland under the Ramsar convention as it supports internationally important species of migratory bird species. 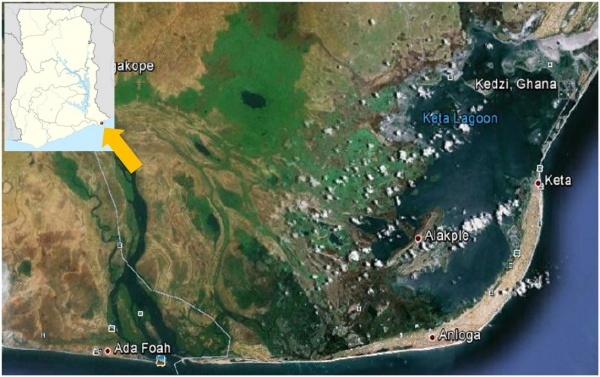 The Keta lagoon is believed to have formed when the sea retreated from the land or moved further away from its previous position 1000 years ago (Dogbey 2015). This created a sandy deposition along the seashore. Other people were of the view that there might be coastal rivers, which have dried up and leave behind large pond because of the remains of oyster shells. Another theory also explains this by linking it to the ice age and that the ponds were remains of an ice which melt due to rise in temperature and it was infiltrated by the sea water (Smith et al., 2006). Towns and villages are scattered over the surface of the Ramsar site – but mainly around the lagoons fringes – and so are the stakeholders and the tourist attractions and facilities (Figure 1). Large parts of the KLCRS are characterized by degraded and monotone flat landscapes. The area has a flat land in terms of topography. Keta, Kedzi and Vodza Township have the lowest point of about 1 – 3.5 meters below sea level. The highest point is about 53 meters above sea level around Abor in the northern part of the municipality. The area has three main geographical belts, which are narrow coastal strips, the lagoon basin in the middle belt and the plain in the northern belt of the municipality. The KLCRS main is drainage basin in the municipality. It serves as one of the major livelihood sources for people living in the municipality. The KLCRS is located in the Keta Municipality of the Volta region of Ghana. The area is within the equatorial climate with an annual rainfall of less than 1,000mm. The Municipality is one on the driest along the coast of Ghana. The major raining season is between March and July and the month September and November usually record the lowest rainfall in the region. The average daily temperature is usually around 30º Celsius with high humidity and high evapo-transportation. The KLCRS mangrove and swamps are the sources of many fish and other sea depending species. The Keta Lagoon has for long been noted for it’s rich coastal and marine biodiversity (Ntiamoa-Badu & Gordon, 1991). The Fuveme to Anloga beach stretch is one of the major sea turtle breeding spots in Ghana. The beaches are the preferred breeding grounds for the leatherback (Dermochelys coriacea), green and olive ridley sea turtle species (Lepidochelys olivacea). According to local key informants, the breeding season extends from November till March when the sea turtles come on land to lay their eggs in the medium grain sized sand. The KLCRS has historically been known as the most important seashore bird site in Ghana (Ntiamoa-Badu & Gordon, 1991). Bird watching is one of the services of the Keta Lagoon recognized by the Ghana Wildlife Society and Ghana Tourism Authority. Afiadenyigba, Fiahor, Woe, Tegbi and Adina communities are the most main parts of the lagoon for waterbirds. In the past, different species of tern (squacco heron, black-winged stilt, curlew, caspian tern, wood sandpiper, and western reef heron) and waders (curlew sandpiper, spotted redshank, greenshank, ringed plover and avocet) were found in the wetland. Some of the main bird species currently found in the wetlands include Great White Heron (Ardea alba) and Pied Kingfisher (Ceryle rudis). Crop farming is one of the most important socioeconomic values provided by the KCLRS for communities and households in the area. The area is noted for being the foremost shallot (Allium cepa var. aggregatum) growing area in Ghana. An estimated 1000 acres of shallot farms are cultivated annually. Tomatoes (Solanum lycopersicum), okro (Abelmoschus esculentus), chilli pepper (Capsicum annuum) and garden eggs (Solanum melongena) are other vegetables widely cultivated by inhabitants within the environs of the wetlands. Other crops including maize and cassava are grown annually by locals mainly for subsistence. Sugarcane cultivation is also undertaken on smallholder and plantation basis by some communities located on the western side of the Avu Lagoon. Locals usually harvest and distil their sugarcane into a local alcoholic drink known as “akpeteshie’. Fishing in the KLCRS remains an important source of protein and income for local people (Ofori-Danson et al. 1999). Locals usually use drag nets in the lagoons for fishing. Other fishing gears used include hook and line, Acadia and traps as well as bottles (referred locally as ‘atukpaxe’) which are majorly used by women. When the lagoon waters are low fish, locals catch fishes using their hands. Reeds mats and basket weaving are also undertaken by communities along the road, from Dabble to Savietula Junction. The reeds are harvested along the lagoon and river banks and then traditionally woven into the famous reeds mats. This activity is one of the major livelihoods next to agriculture, fishing and mangrove forest cutting for these communities. The development of this activity into a touristic attraction can add to their livelihoods. Salt mining is widely undertaken by communities, especially those in the Kedzi and Adina areas. Both men and women engage in this activity. Salt is sold mainly to buyers from Mali and Burkina Faso, although some quantity is sold in local markets. The KLCRS has been identified for its potential for various water activities. Boat cruises and canoe and kayak trips are just a few activities to be undertaken on water. As an important waterbird site, spots for both day and overnight bird watching have been created for tourists and recreationists (Figure 2). A number of private tour operators organize birdwatching safaris for local and foreign tourists. Figure 2 shows a tourist centre constructed at Kedzi on the KLCRS. Historical buildings and heritage sites such as St. Paul Lighthouse, located in Woe and Fort Prinzenstein in Keta are important tourist attractions in the area. St. Paul Lighthouse was built by the Dutch in 1802 to guide ships anchoring at the coastline. Fort Prinzenstein was constructed by the Danes in 1784 as a trading structure at the onset and later as a slave dungeon. The people who inhabit the KLCRS have a strong spiritual attachment to the lagoon. Practitioners of the traditional belief system (Voodoo) believed that the lagoon has gods who must be worshipped if the people wish to get an abundant catch. Some rituals are performed once a year for the lagoon gods to provide bumper crop harvests and fish stocks. These traditional believes are in decline in recent years. The threat of sea erosion remains a major concern to household and communities in the KLCRS. The erosion problem at Keta lagoon was first noticed in 1907 (Akyeampong, 2001). Over the past decade, some of the communities most threatened by advancing tidal waves resulting in the destruction of physical infrastructure include Kporkporgbor, Fuveme, Dzita, Havedzi and Xorvi (Boateng, 2009). Fishing and farming livelihood systems have also been negatively affected by annual erosion. Consequently, many people, especially the younger population have migrated out of their communities and Keta Municipality as a whole. Linked to coastal erosion is the problem of perennial flooding, experienced by communities in the KLCRS. 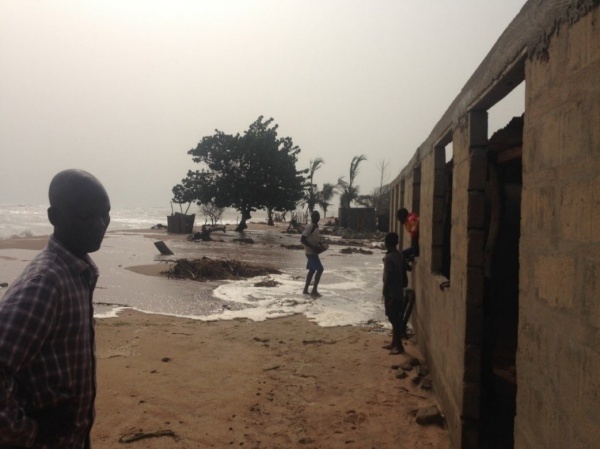 Flooding has led to the loss of a greater proportion of the residential and public infrastructure and road linking Keta, to its northern neighbours. Constant flooding after heavy rains has caused harmful changes in salinity and flow of the Keta Lagoon ecosystem. One of the most vulnerable communities to perennial flooding is the Keta township (see Figures 3 and 4). 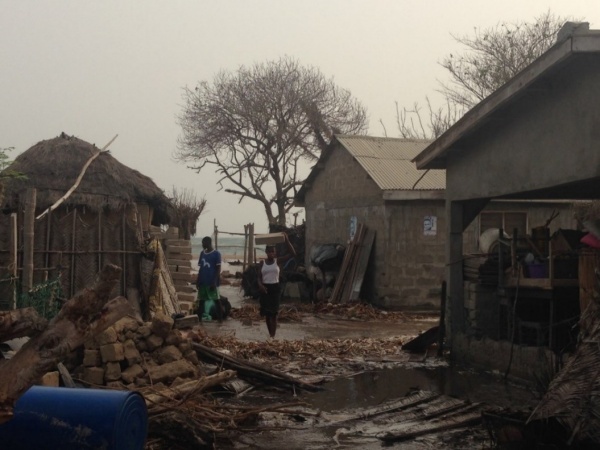 Part of Keta Township has been washed away and taken over by the sea in recent years. Disagreements and disputes over access and methods for extraction of natural resources provided by the lagoon are noted in this socio-ecological production landscape. For instance, fishermen from the Afiadenyigba community, known for using drag nets for fishing in the deeper waters near Woe have often being accused of stealing fish from Woe fishermen seine net. On many occasions, cutting of mangrove trees for smoking of fish resulted in arguments of ownership. Some of these conflicts are tied to differences in cultural values, social norms and sanctions of local communities. In addition, ignorance of local communities concerning natural resource extraction causes degradation and destruction of lagoon wildlife including mammal, reptile and amphibian species. For example, even though the sea turtle species is threatened according to the International Union for Conservation of Nature Red List of Threatened Species, seas turtle poaching by fishermen for sale and domestic use is widespread. Red and white mangroves in the KLCRS have been cut down for fuelwood by locals, thus destroying the spawning and breeding grounds of fishes. The Sea Defence System: To combat the sea erosion in Keta, Ghana’s Ministry of Works and Housing undertook a sea defence project to protect and stabilize the shoreline from Keta to Hlorve with 8.3km long road. The Keta Sea Defence project started after the award of the contract to the American company, Great Lakes Dredges and Dock Company (GLDD) in 1996 created a canal between the lagoon and the sea so that over flooded water can go through the canal into the sea. A road was constructed through the lagoon from Kedzi to Metsrikasa for the transportation of the boulder rocks used for the construction work. Since there is no bridge for the water to flow through, the road created shallow waters to the eastern part of the lagoon. Lagoon flood control was one of the interventions to reduce flooding and to reduce the losses incurred by farmers as well as to increase their production. Overall, the sea defense project aimed to achieve the following objectives: (1) avoid transferring the erosion problem to developed areas down-drift and northeast of the study area (2) minimize disruption to human activities associated with the coastline, particularly seine netting and the launching of fishing canoes; (3) stabilize areas of existing and planned development; and (4) prevent flooding of the coastal communities. The Sea Defence made provision for shelter for people affected by erosion and flooding. The project, however, did not fully fulfil the housing component of the project. The houses constructed could not accommodate all the people who have been affected by the erosion. Enhancing Community Action for the Conservation and Sustainable Management of the Keta Lagoon Complex Ramsar site, Ghana: This initiative was funded by the Wadden Sea Flyway Initiative with support from the Wildlife Division of the Ghana Forestry Commission. The main aim of the project was to enhance community action for the conservation and sustainable management of Keta lagoon. Radio Programmes on wetland conservation, production of educational and awareness materials, conservation education in schools/communities and habitat restoration are some of the activities planned under this action. The action specifically targets local social groups including decision makers, youth, fishermen, farmers, women and school children. Ecosystem-based Disaster Risk Measures: The private sector through individuals, volunteer groups and Non-Governmental Organizations (NGOs) have in recent years been working with local communities to plant along the banks of the lagoon to reduce the rate of evaporation as well as siltation of the lagoon. Communities are increasingly planting groves of coconut to help cope with high tides effects. For instance, in Keta, youth groups have been active in tree-planting projects. Woodlots using indigenous trees are also being established in a number of communities in the KLCRS. Beyond the present threats and vulnerabilities of the KLCRS, the lagoon is expected to be directly or indirectly impacted by sea level rise, storm surges, temperature and precipitation changes in the future These will likely affect the physical structure, ecological properties and the social values associated with KCLRS, and further affect the livelihoods of the residents that depend on them. Already, coastal erosion and flooding have destroyed the livelihood and properties of many communities and households. Unsustainable use and management of the ecosystem services provided by the lagoon require urgent action. Educating resource users on the most appropriate environmental and conservation practices for the protection and health of the Keta Lagoon for sustained socio-ecological benefit is imperative. Akyeampong, E, K. (2001), Between the Sea and the Lagoon: An Eco-social History of the Anlo of Southeastern Ghana. Ohio University Press Athens Ohio. Dogbey, S.Y. (2015). Analyzing Post Coastal Erosion Livelihoods after the Construction of the Keta Sea Defence Project and the Resettlement of Coastal Dwellers in Keta, Ghana. Master Thesis, Department of Geography, Norwegian University of Science and Technology, Trondheim, Norway. 128p. Ntiamoa-Baidu Y. & Gordon C. (1991). Coastal wetlands management plans: Ghana. Report to the World Bank, Department of Zoology, University of Ghana, Legon. Ofori-Danson P. K., Entsua-Mensah M. & Biney C.A. (1999). Monitoring of fisheries in five lagoon Ramsar sites in Ghana. Final report to the Department of Wildlife under the Ghana Coastal Wetlands Management Project. 116 p.
Smith, C. G., Cable, J. E., Martin, J. B., Cherrier, J., & Roy, M. (2006). Mixing in the subterranean estuary: a comparison of Radon-222 porewater models. Coastal Hydrology and Processes, 355-368.